If you’re in the market for the cheapest possible Bluetooth headphones that still sound great and last a while, the Senso ActivBuds will tick most of those boxes. 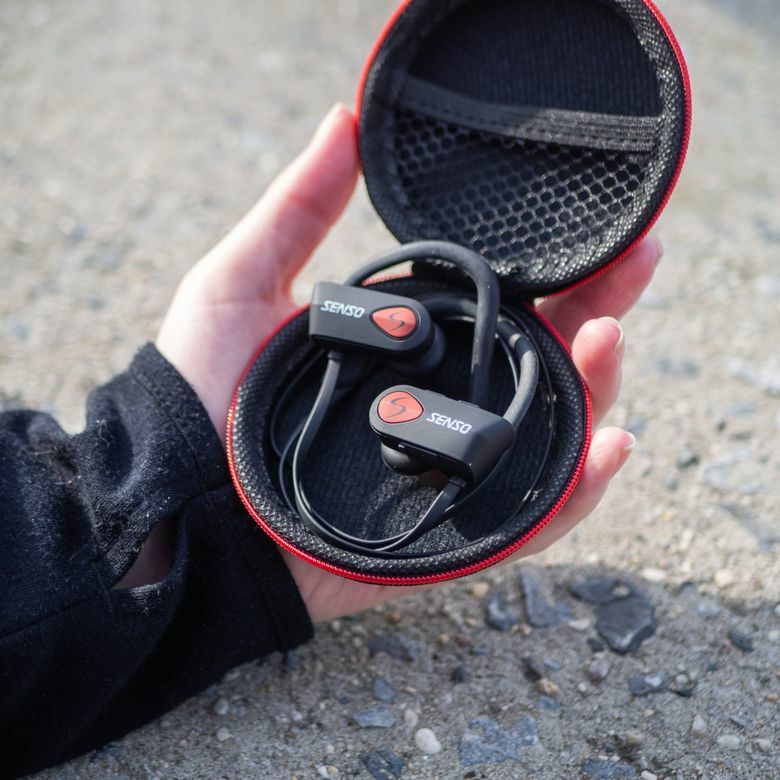 Whether you’re looking for a go-to set to throw into your commuter bag or a lightweight pair to wear while working out, the Senso ActivBuds will serve both purposes. At under $30, you’re in no danger of breaking the bank and you still get features like IPX7 water resistance and a customizable fit. For those on a tight budget, the Senso ActivBuds are hard to beat. We tested a pair in New York City for about a week, using it on our commute and out and about the city to test out build quality, comfort, sound, and battery life. With bendable over-ear wings, a main body that extends backward from the ear, and the option for red accents on black construction, it’s clear that Senso was aiming for the same look as the Beats Powerbeats 3 earbuds. The left and right earbuds are connected with a flat and substantial-feeling cable that measures just under two feet in length. It comes with an affixable crimping piece that lets you shorten the cable if needed. We found that the length was decent and because of the flat, tacky nature of the cord itself, wasn’t easily tangled. Those same colors are carried over onto the textured, circular, hardshell zipper case. Compared to other brands of headphones in the class, these look just okay — they are a little big, and because their aim is to emulate a more expensive brand, you’ll only fool people from afar. But if you like the feel of a stabilizing wing above the ear, the construction is pretty good for the price. Also worth noting is the fact that the Senso ActivBuds are IPX7 rated, letting them handle a rinsing under the sink and exposure to things like rain and sweat. Just don’t keep them immersed in water for long periods of time. The over-ear wings obviously serve one main purpose: to affix the earbuds to your ear and take some of the weight off the eartips. When pulled straight (and they can be pulled straight), the wings are four inches long, which is enough to cover even the biggest of ears. This was actually one of the most surprising aspects of the wings. They have an inner bendable wire that holds them strong in whatever position you contort them, meaning you can tighten them to fit your ears and they will stay snug. We found that while the headphones are heavy when jogging (about 0.7 ounces), even though your outer ear shares the weight with your inner ear. Fortunately, the ActivBuds come with a set of three interchangeable tips. There are three sizes of opaque rubber tips, the largest being about a 1/2 inch, the smallest about 1/3 of an inch, and a final set somewhere in the middle (the ones that ship on the headphones). They also come with a denser, half-inch foam set of tips in case you don’t like the feel of silicon. All of this amounts to a pretty customizable fit that should make you almost forgive the weight. On the downside, there’s no remote to be seen meaning the controls are lacking, and all of that 0.7-ounce weight goes to the earbuds themselves. Setup was easy enough on the ActivBuds — a long hold on the logo button on the right earpiece puts it into pairing mode, allowing it to quickly show up on your device’s Bluetooth list. You can also easily pair it to a second device, though it only let us play and pause music on one device at a time. Switching is seamless though. One small gripe: pressing in on a large button is a little uncomfortable when the earbuds are in your ear. We prefer the remote- or top-mounted buttons for this. Speaking of remotes: these headphones don’t have one. This caused a couple of issues when interacting with our main device. First off, you have to reach up to your ear to adjust volume or Play/Pause a track. A larger issue was, even though Senso advertises that a microphone is built into the earbuds, the few calls we conducted on these were very muffled. Some fiddling with the angle helped, but if you plan to use your earbuds for phone calls, we’d recommend picking up a pair with a dedicated remote-oriented microphone. These headphones cover a frequency spectrum ranging from 20Hz to 22kHz. For reference, the entire spectrum that a human is capable of hearing is 20Hz to 20kHz. So, on paper, these headphones should provide everything your ears would be able to register. In our experience with the ActivBuds, there was a lot of bass response — far more than we would normally expect from earbuds with small drivers. This was a pleasant surprise on the noisy streets of NYC, as bass is usually the first thing to get buried by the dull roar of traffic. But you do sacrifice the clarity you get from higher-dollar earbuds, as the bass and the low-mid frequencies easily swallow up the detail higher in the spectrum. In our experience with the ActivBuds, there was a lot of bass response — far more than we would normally expect from earbuds with small drivers. The other thing to consider is the codec — Senso doesn’t clearly advertise the codec, but our tests showed that it was transmitting audio via our phones or computers using the lossiest SBC protocol, meaning a significant degradation in sound quality. It’s to be expected at this price point, but it’s important to keep in mind. One last point on sound quality is to discuss the passive noise reduction included here. SENSO has loaded in Qualcomm’s CVC 6.0. It isn’t the same as active noise canceling, that requires a literal sound to be projected to cancel out noise. Rather, it’s a protocol using proprietary algorithms to help clarify the sound and avoid some external noise. It’s important to note that the tech was created mostly for noise handling during cell phone calls, and we didn’t notice much reduction ourselves outside of the normal suppression simply by your ear being plugged. But, at the end of the day, the sound quality here will definitely suffice for workouts and casual commute usage. Battery life was probably the best feature of the ActivBuds. In a lot of ways, the reliance on wireless headphones after the death of the headphone jack on so many popular smartphones has resulted in just another device for us to charge. So, in our tests, we put a high value on the battery life offered by Bluetooth headphones. We spent about three or four days with these headphones, and we can confidently say that you’ll get a ton of battery life with them. These buds contain an 85 mAh battery that you can recharge with a short, included micro-USB cable. Senso’s spec sheet lists the hours of play time at up to 8 hours of usage and up to 240 hours of standby time. They also claim that you can charge up the headphones fully in under two hours. We spent about three or four days with these headphones, and we can confidently say that you’ll get a ton of battery life with them. Obviously, the 240 hours of standby is a nice safety net, so we weren’t surprised to see them last the week once we shut them off and tossed them in our bag. By our estimates, we got closer to 10 hours of music and podcast listening, and that’s with high volume. Shortcomings aside, the SENSO ActivBuds sit right below $30 at the time of this writing. A cursory search shows us that they don’t often cost much more or less than that. This puts them firmly in the low end of Bluetooth earbuds that are worth buying, but with a few features that punch way above their weight. Aside from great battery life and volume, the ActivBuds even come with a few mobile accessories, like a car phone mount and a stick-on smartphone card slot. The jury is out on how good these freebie accessories are, but as a whole package, it’s hard to beat this deal. There’s a strange, invisible border between “low end” and “high end” for Bluetooth exercise headphones. You’re either paying $20 to $50 or $80 to $150. The fairer competition for the ActivBuds is obviously the lower range, and in that group, you’ll find similar offerings from brands like Anker, Mpow, and Zagg. The Senso’s have nothing special to make them stand out against the Mpow Flame which has a similar price and feature set, but by the same token, there’s nothing that makes them worse either. Want to look at other options? Read our list of the best wireless earbuds. These sturdy Bluetooth headphones offer decent sound, good fit, and an affordable price tag. The Senso ActivBuds do what they’re supposed to and last a long time. There is little to differentiate them among other specific headphones in the range, but the build quality seems great, the fit is easily customizable, and the sound quality, while muddy, should service most music listeners.